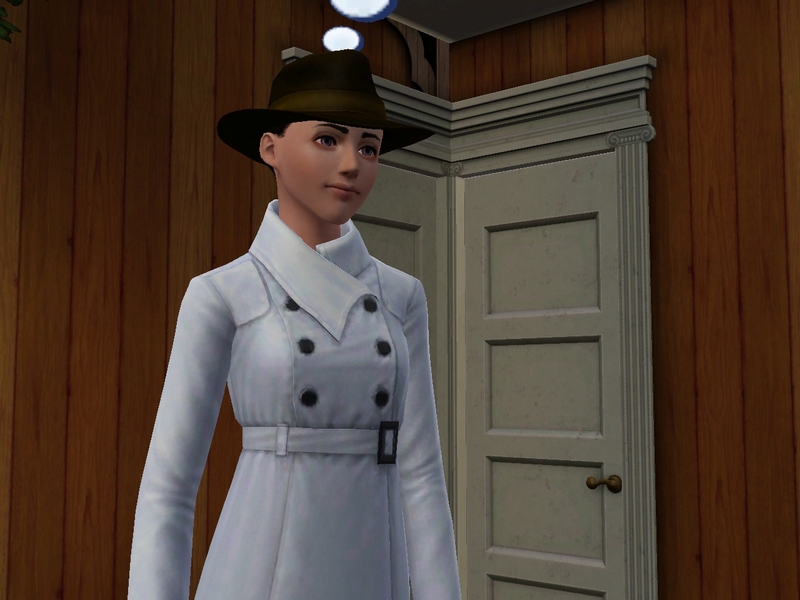 After Deanne’s birthday, Jin headed out on a mission of her ow. She seemed pretty nervous, but not so nervous that she couldn’t appreciate the local scenery. She headed straight to Chauncey’s house. She must have been worried about what he would think of her new, older self. But she needn’t have worried. Jin and Chauncey are the same age, after all. They headed inside to do whatever it is they do when they’re alone. It’s certainly none of MY business. 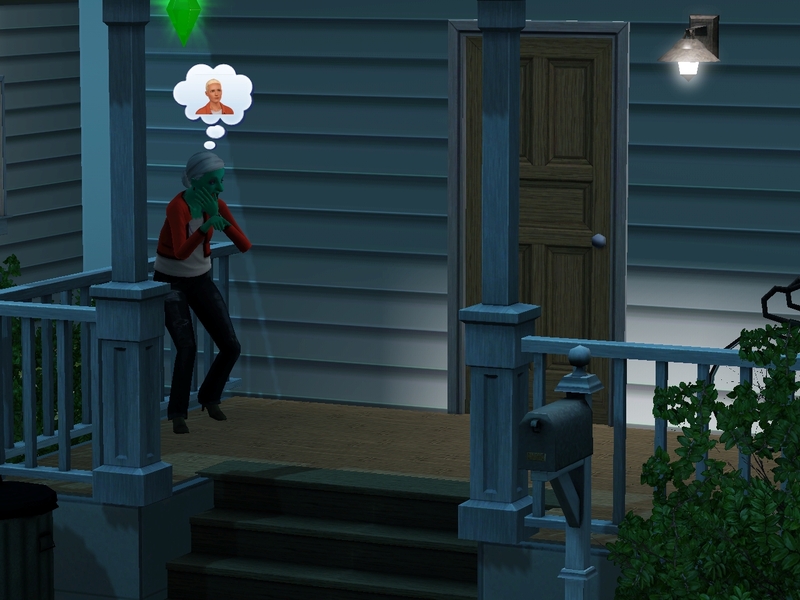 Well, she didn’t come home that night. 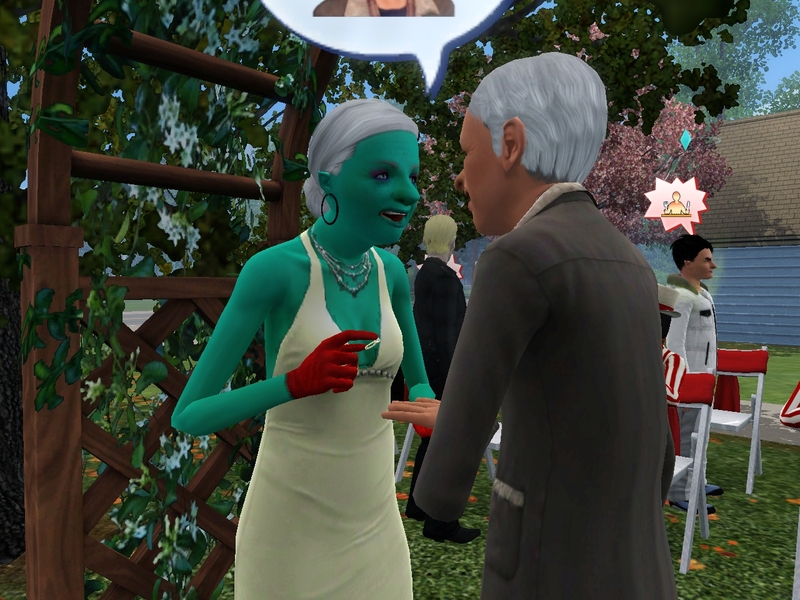 She called in the morning to tell me that we should get the family out to Eerie Festival Grounds, and we should dress up. Who am I to question Jin? We even brought out little Erin, who wasn’t terribly thrilled. 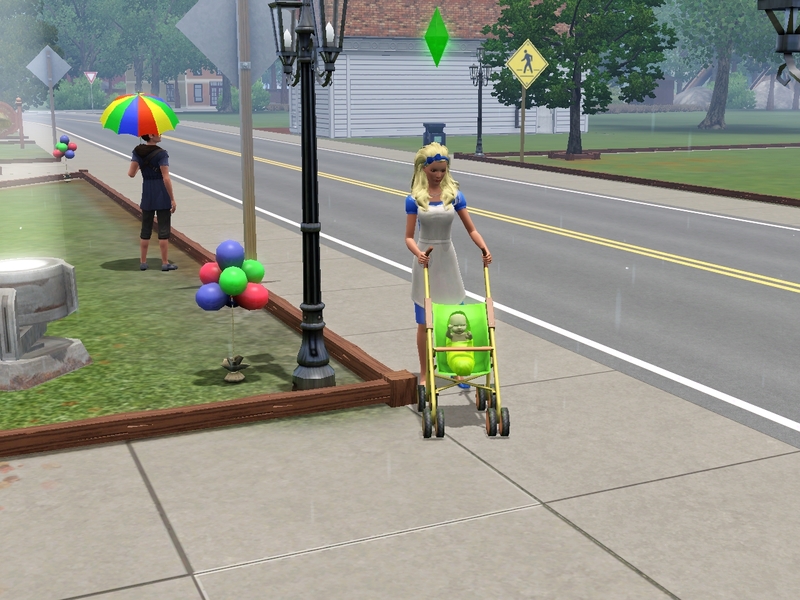 I guess she just needed out of the stroller to play. Then Jin showed up, looking like a million bucks! And it started to hail. Chauncey seemed surprised, but he decided now was as good a time as any. Chauncey’s such an easy-going fellow. Jules MacDuff didn’t seem to be getting the hint, though. He’s not terribly good about personal space. 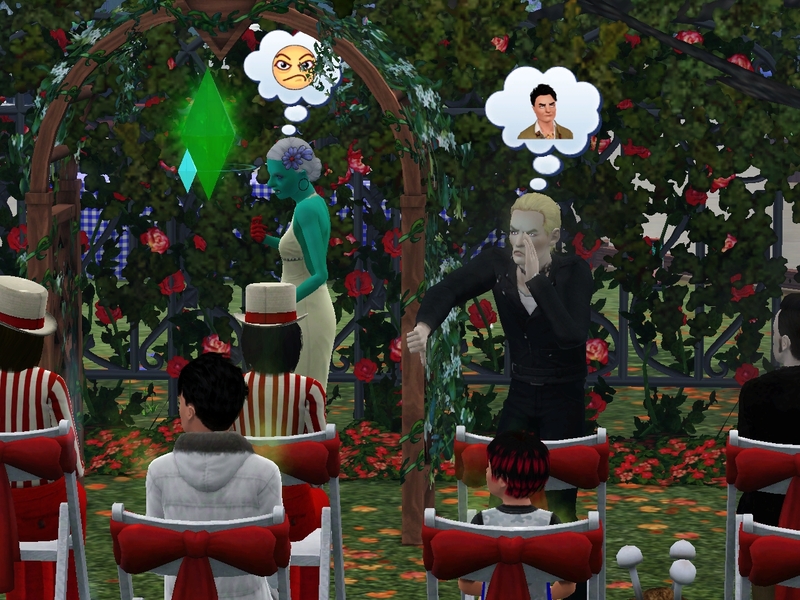 Another unhappy wedding guest was Ayden van Gould. And you can add William to Jin’s fan club. He seemed to have something against Branden. 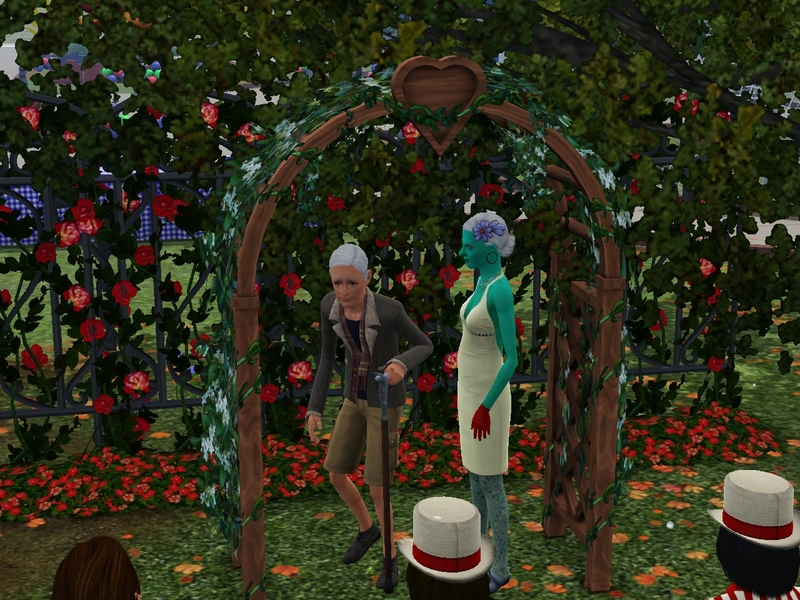 It took quite a long time for Chauncey to make it from one side of the park to the ceremony. I thought Jin’s look was going to burn my head off. But at last Chauncey made it. You just have to give those seniors extra time. “I know what we’re doin’ tonight!” Chauncey declared. 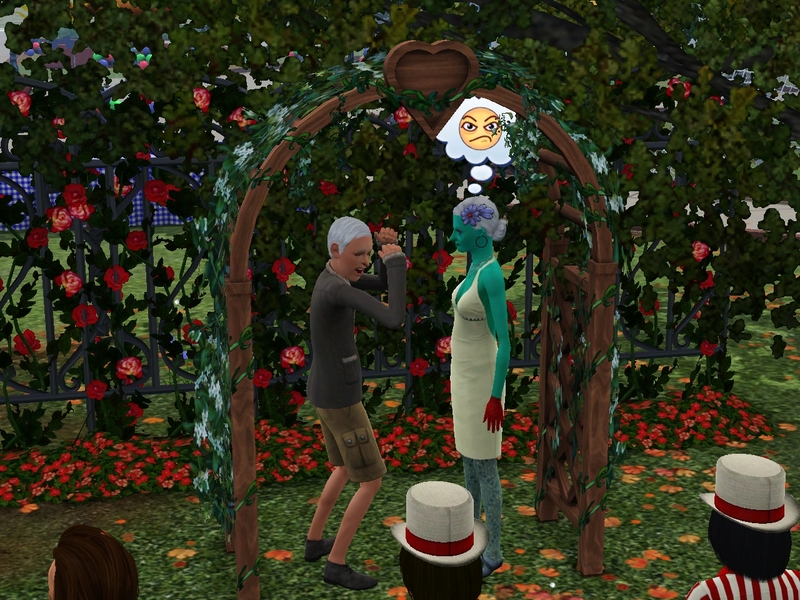 Then they got to the vows. And Jin was Mrs. Jin Grimm-Anjali! I was so happy for her! 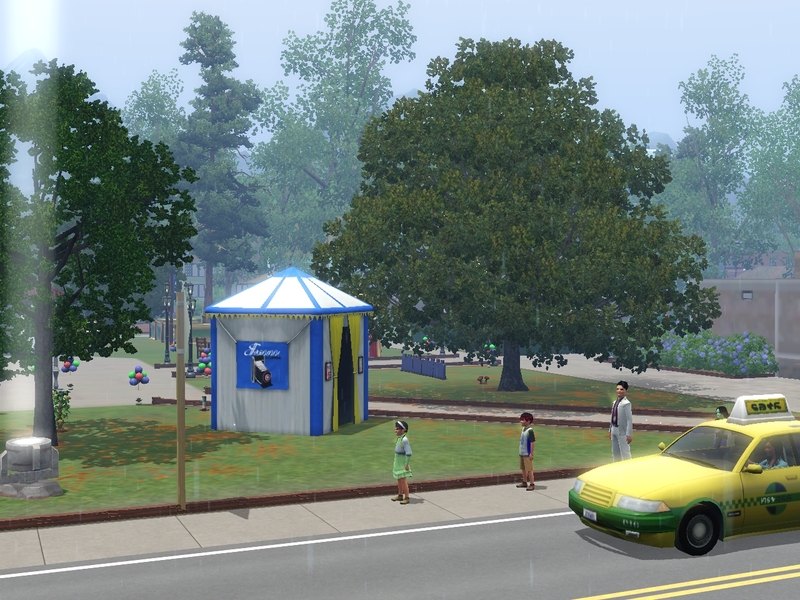 I’d been hoping that we could have Erin’s birthday in the park, but it was still hailing, and Erin was still screaming on the sidewalk, so I decided to take the family home. 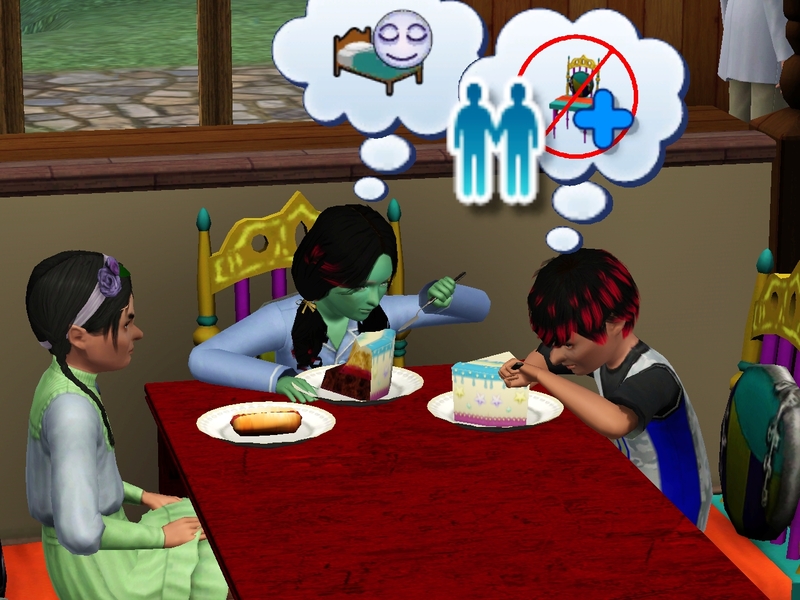 I invited Jin and Chauncey back for birthday cake, but they seemed to have something else planned. Oh, well. The house sure isn’t going to be the same without her. Wow, two major parties in one day! At least Erin’s was in out of the rain. And here’s my little Erin! What a beautiful little girl! She better be a genius at potty training. That’s all I have to say about that. Branden bailed out on cake because apparently prom was tonight. It would have been nice if he’d told me beforehand. I don’t even know if he had a date! 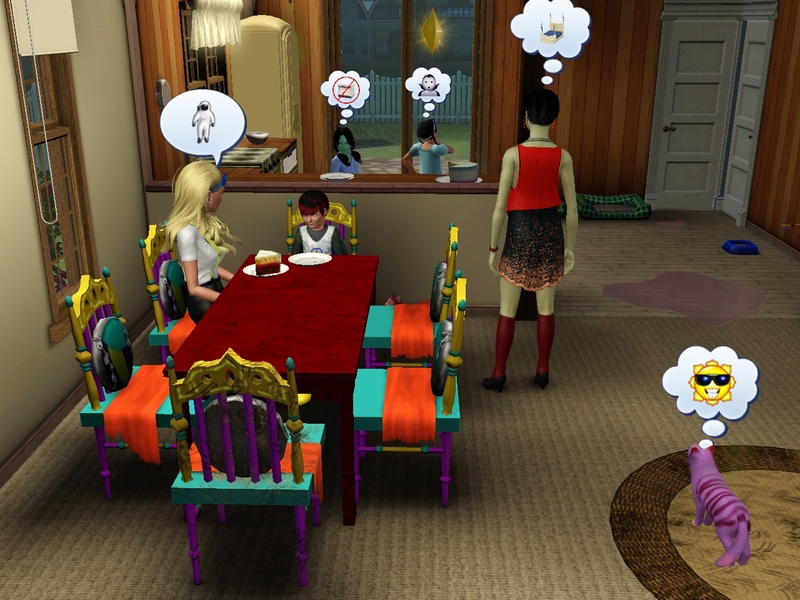 The other kids bonded over cake, though. I event got to have some while Hetal put Erin to bed. 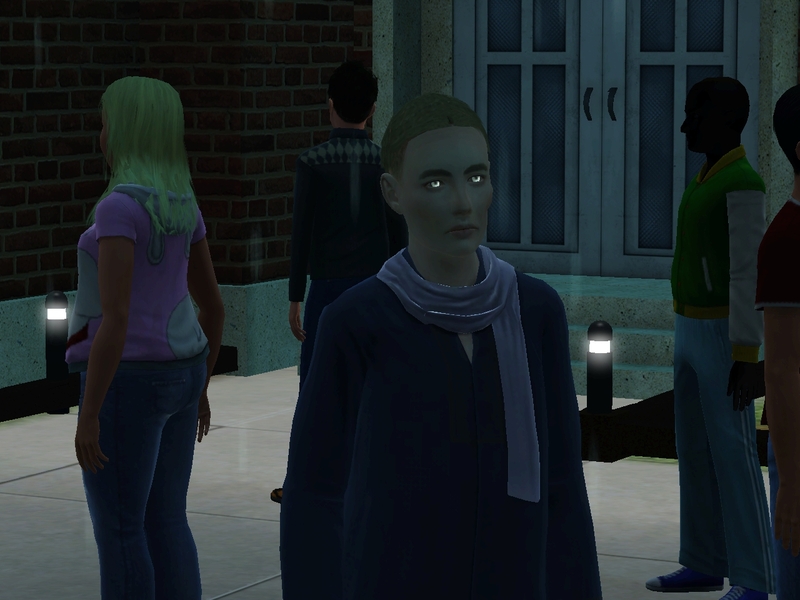 Oh, and somebody we don’t know crashed the party. I’m starting to get really tired of the lack of privacy around here. I waited up for Branden and asked him how prom went. 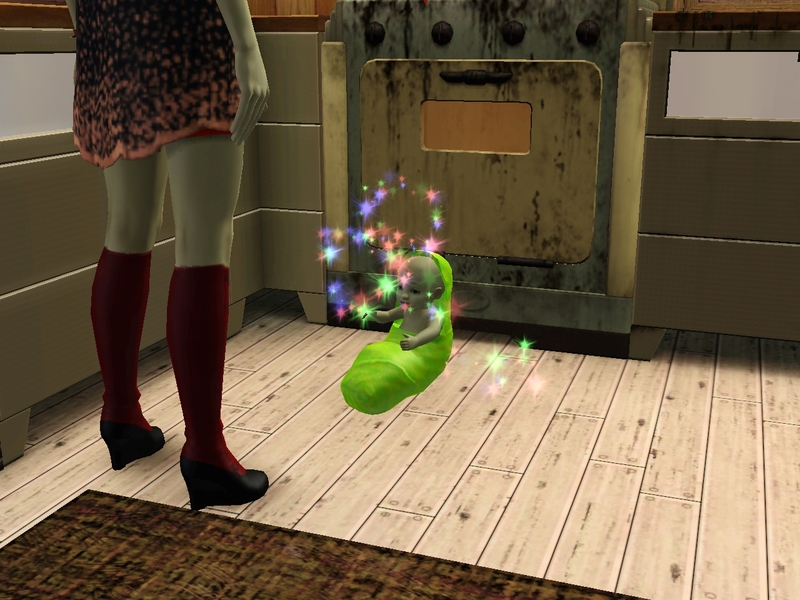 See, I really am a good mom! He said it was kind of boring. 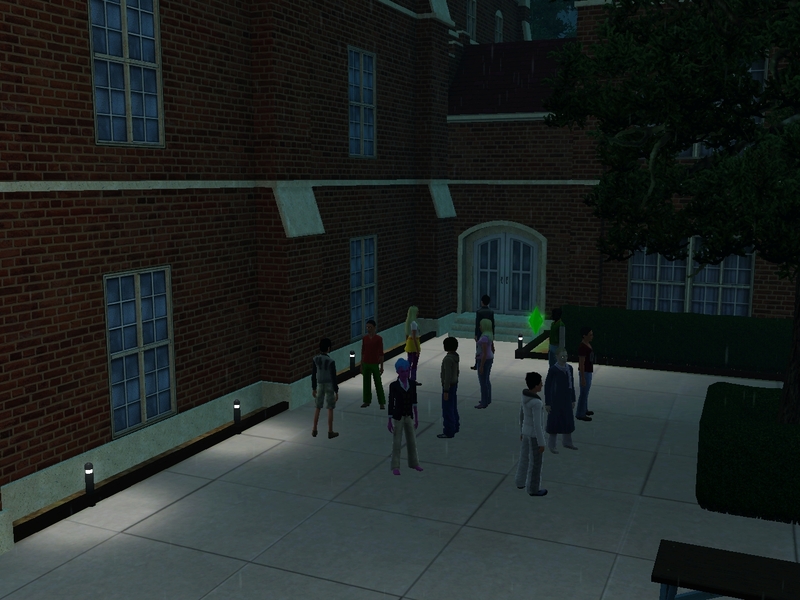 Most of the time everyone just stood around. 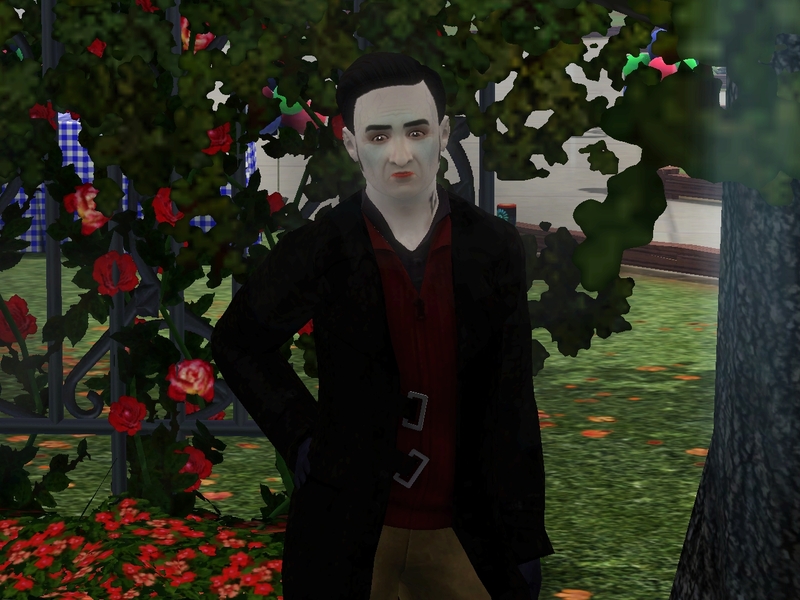 But he did get to hang out with Larry Pierce for a bit. And he met this wonderful girl Lacey! 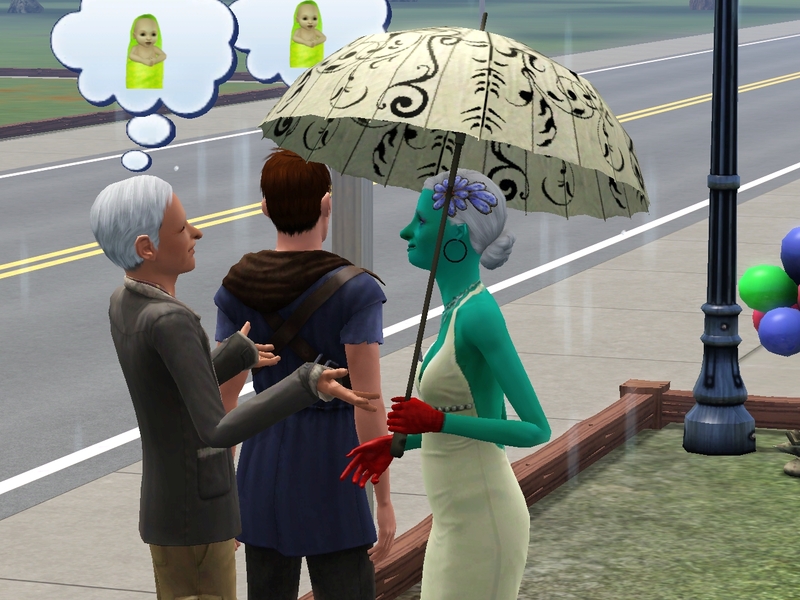 He couldn’t stop talking about her. He says she’s the most beautiful girl he’s ever seen. 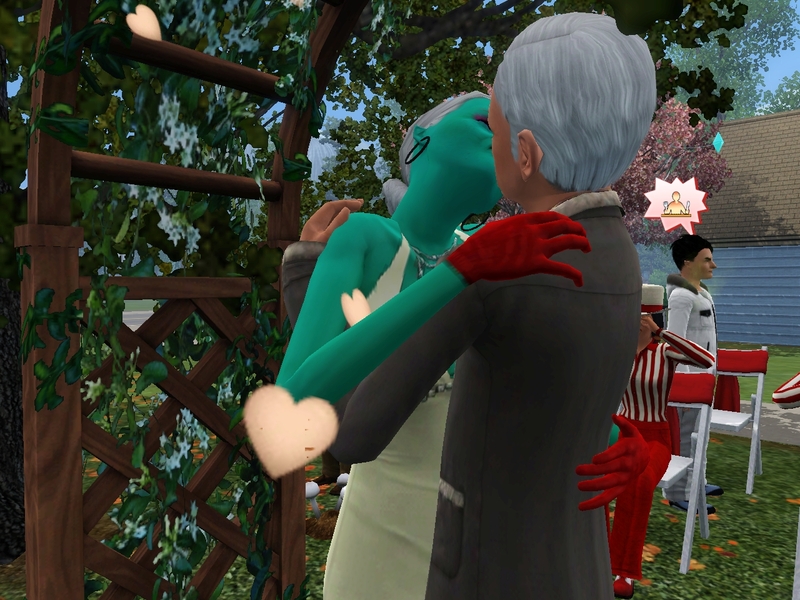 And she even danced with him.! Well, I can’t wait to meet her! During the night, it seems we had a vistor. Our house seems to be popular with people from everywhere, I have to say! Wait, we still don’t have any fails! Two posts without fails? How is that possible?? 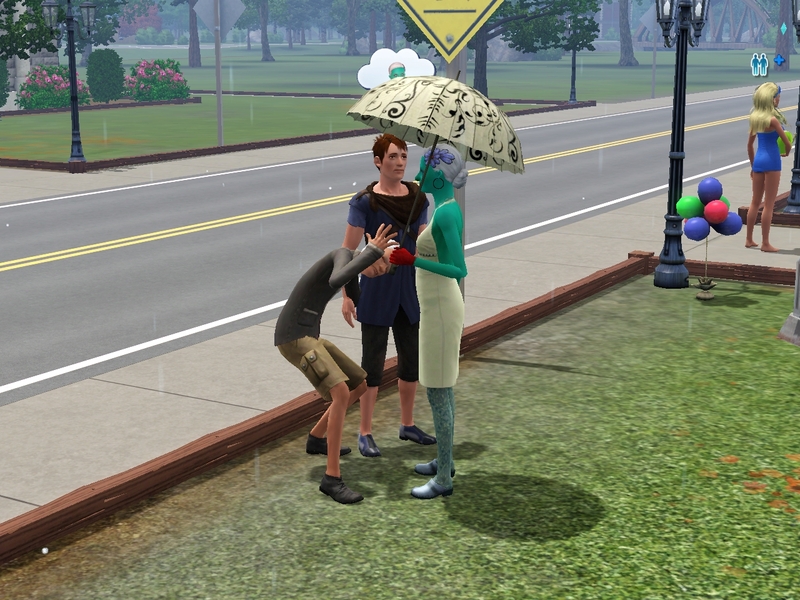 Does dumping your baby on the sidewalk in a hail storm so you can go watch a wedding (outside in a hail storm) count as a fail? OMG, all of a sudden I’m not so annoyed about having a fifth kid. Erin is perfect. Hetal’s skin, Jin’s hair, Allison’s eyes, Hetal’s nose, and Allison’s eyebrows. She also has Anjali pointed ears (not visible with that hairstyle), and I think she has Hetal’s expressive mouth. 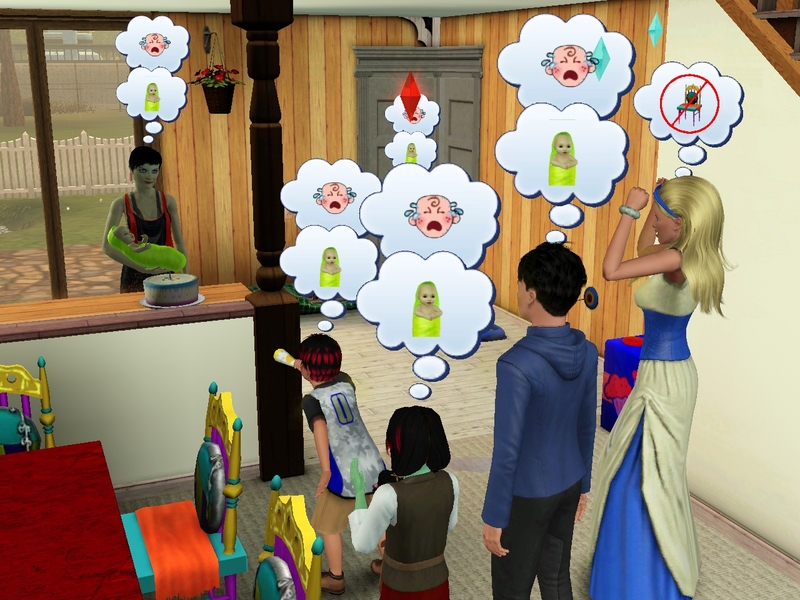 That’s just what I see from her as a toddler! 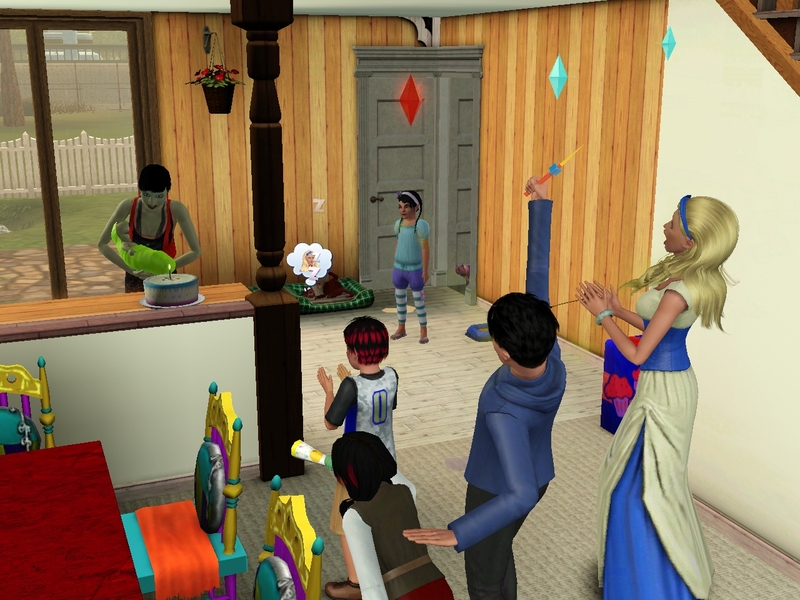 I considered keeping Jin around as slave nanny for one last child, but I wanted to get her out of the house to have some of her own life. I don’t know how the Wonderlands will manage without her, but I bet she’s happier now. 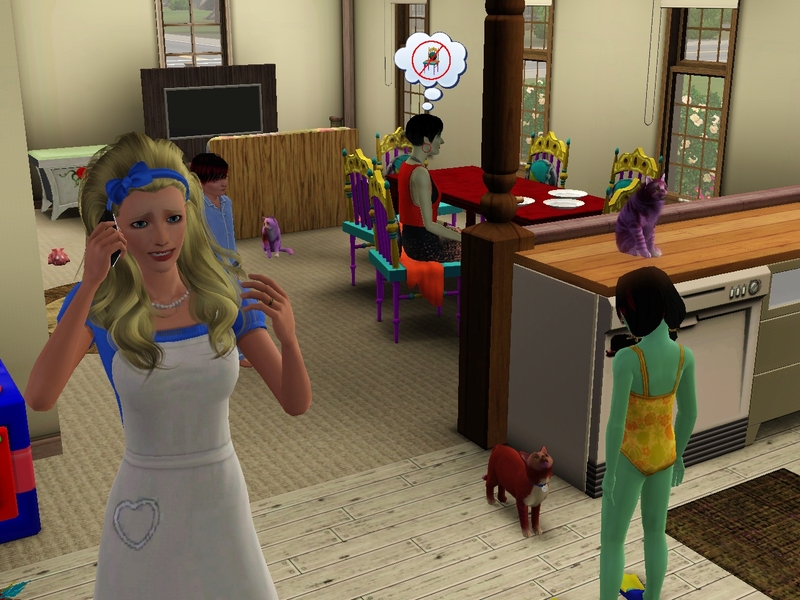 ← And the feline Wonderland heir is…. Erin really is a cute toddler 🙂 I can't wait to see how she fits into this crazy household. 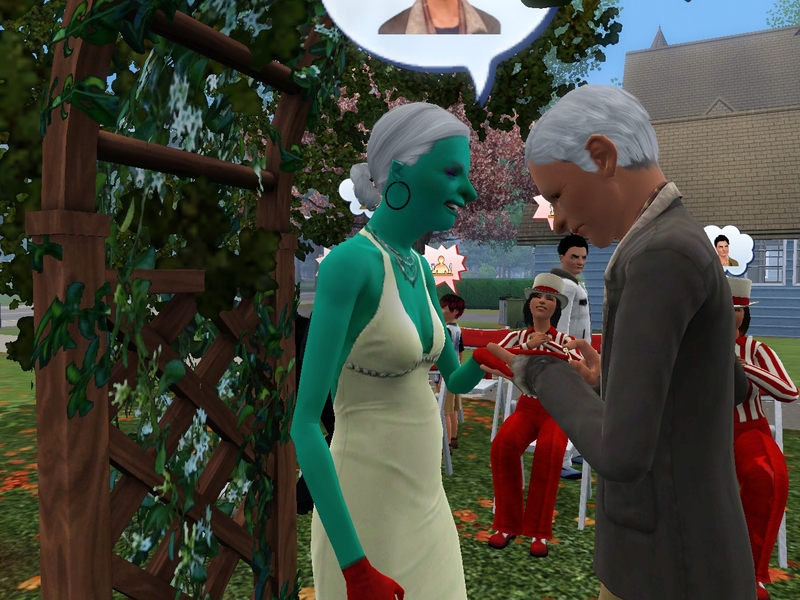 And I'm happy for Jin, a wedding in her age is great! wow I can't believe I caught up! well at least I can vote in polls now. Erin really is a doll, I think she is my favorite already. Wow! You caught up fast! Thanks for reading! I'm almost caught up again to present gameplay, so I think I'm only 4-5 days ahead of this post. Erin hasn't grown into a child yet, but I have to admit that I think she's the most adorable toddler of the Wonderland clan. Most toddlers seem pretty generic to me, but her face is just so expressive. However, I just got back from a business trip where I wrote my little heart out, so I have two more posts queued up to go out in the next couple of days. Watch this space! 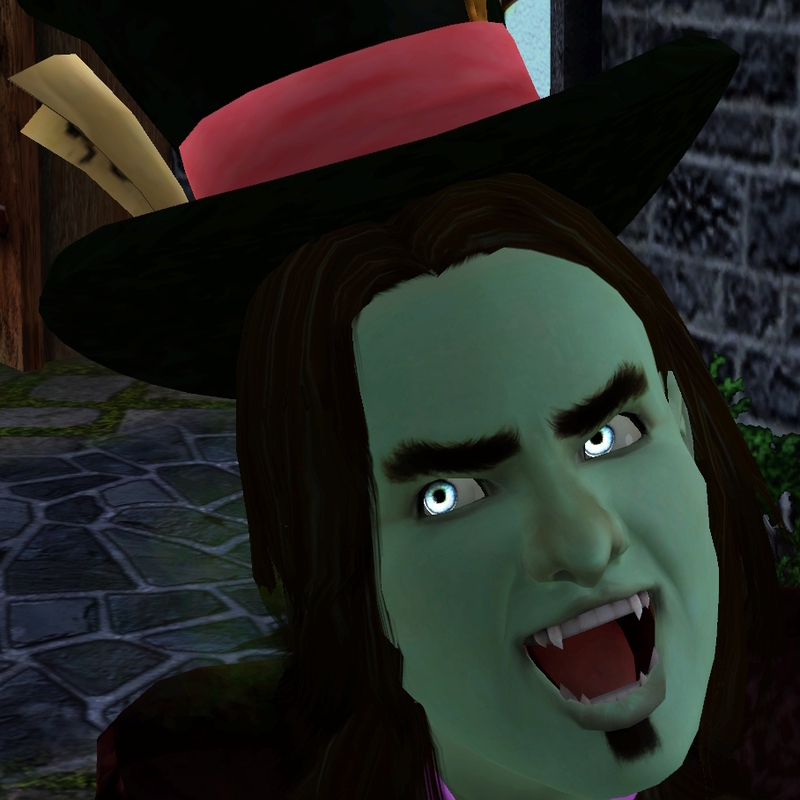 I'm REALLY ready to get the heir poll now, but with Erin in the running I pretty much have to wait until Branden's birthday to get everyone as old as possible. I am counting the days until Erin is a child, lemme tellya. So is Allison, but for different reasons :). I really wanted Jin to get married, and with that crowd of admirers, I think she married her best friend. She earned some happiness. The big question is whether the Wonderlands can survive without her. Erin is adorable! She does seem to be a great mix between Allison and Hetal. 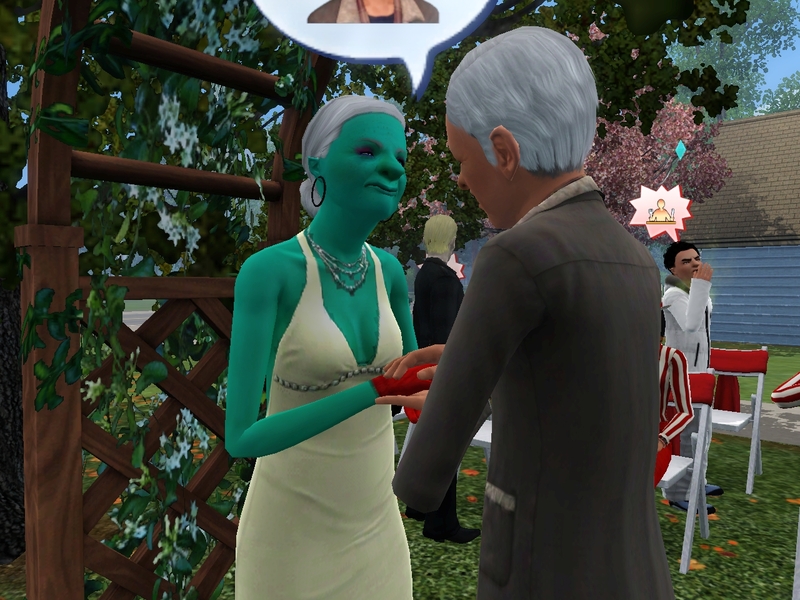 I love that Jin got married and gets to have some well-earned retirement fun now that she's an elder. 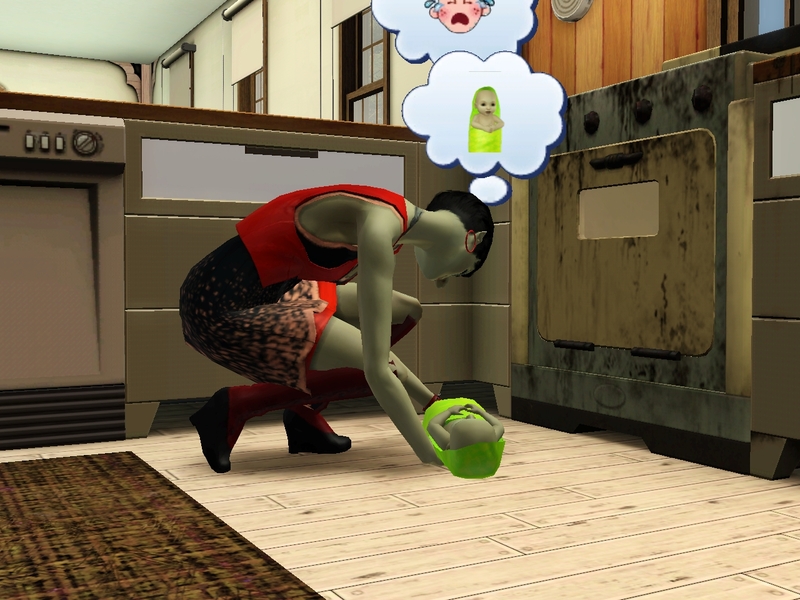 I hope that Allison can keep it together through one more toddler! Branden met a girl! That's so sweet! I forgot to mention that all of the random people around the house continue to crack me up. How weird! Yay! 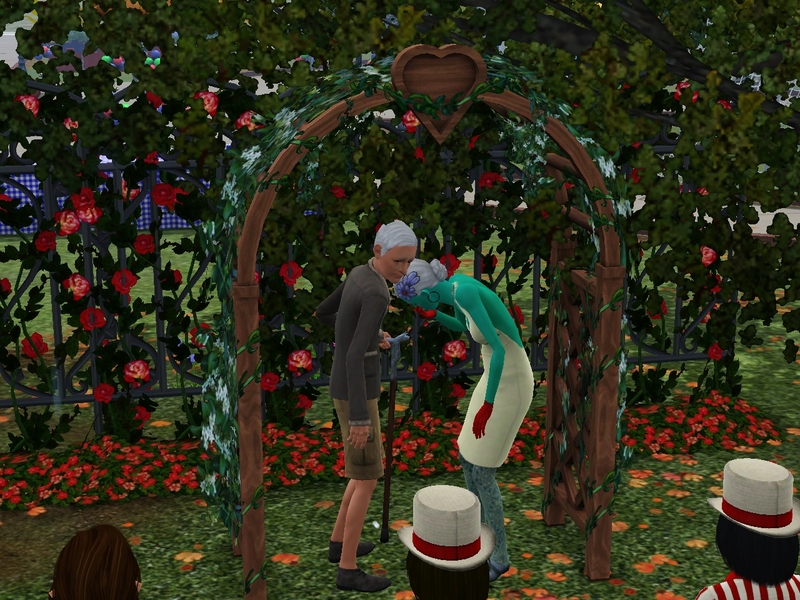 Jin and Chauncey finally get their happy ending! To be honest, its probably better for Allison's sake that Jin moved out. 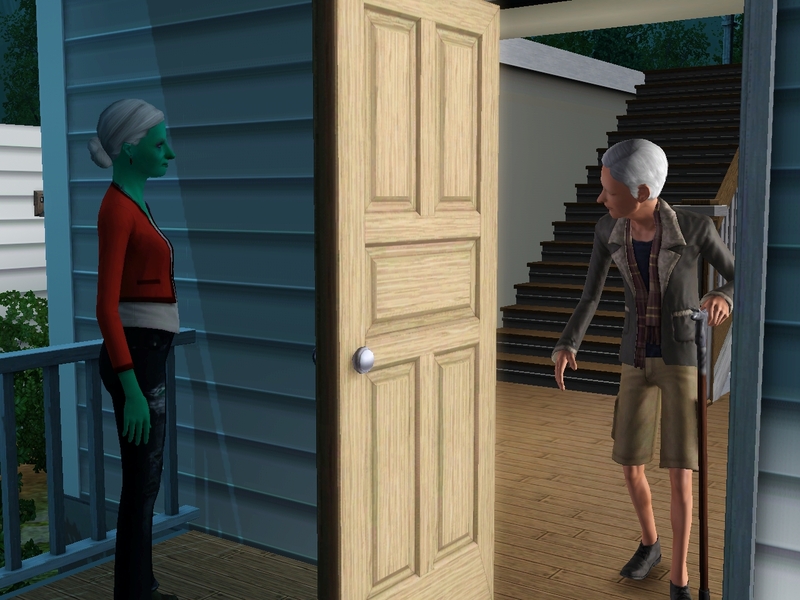 She has a very active woohoo life that I'm sure would embarrass her grandchildren no end! "Does dumping your baby on the sidewalk in a hail storm so you can go watch a wedding (outside in a hail storm) count as a fail?" – No, just bad parenting! Ha! Anyone who takes parenting advice from Allison is in big trouble! The plan actually was to have Erin's birthday party at the park. Then the birthday cake could double as wedding cake. 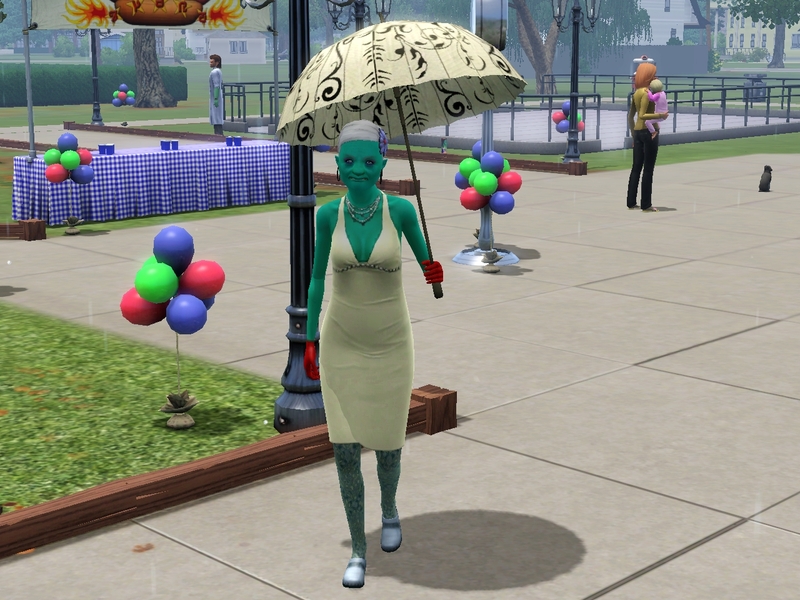 But the game apparently didn't like her lying on the sidewalk in the hail either and reset her back home. 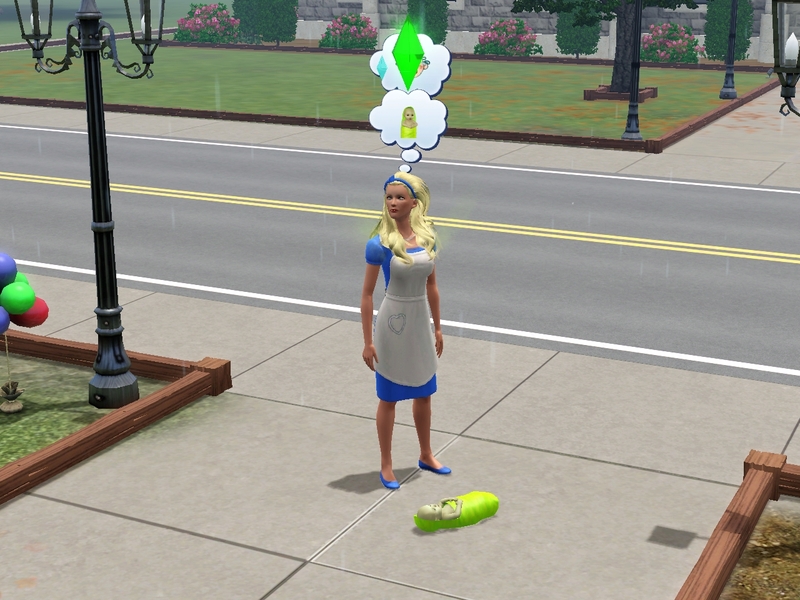 I couldn't find any way to teleport her back to where she was supposed to be, so I had to give up that plan and send everyone home for her age-up. 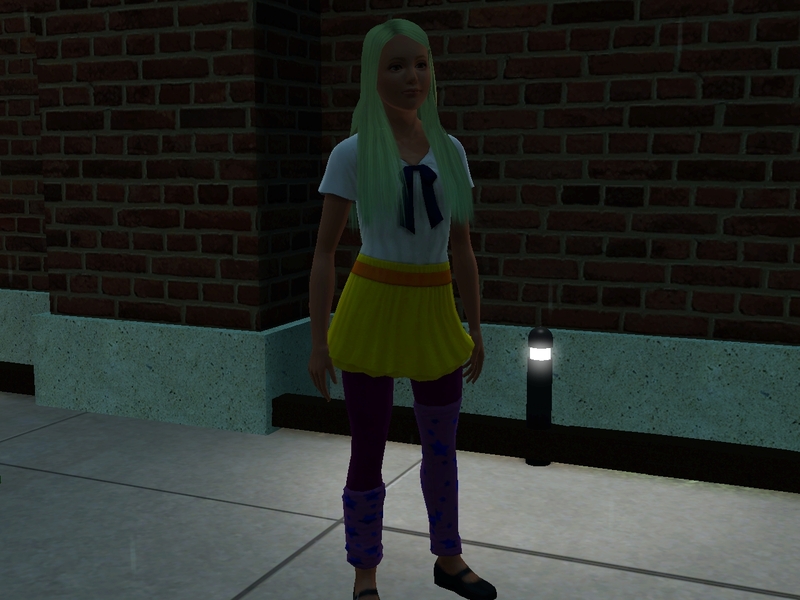 Lacey does look cute. I like that even idiots can pick up love interests and go on dates. 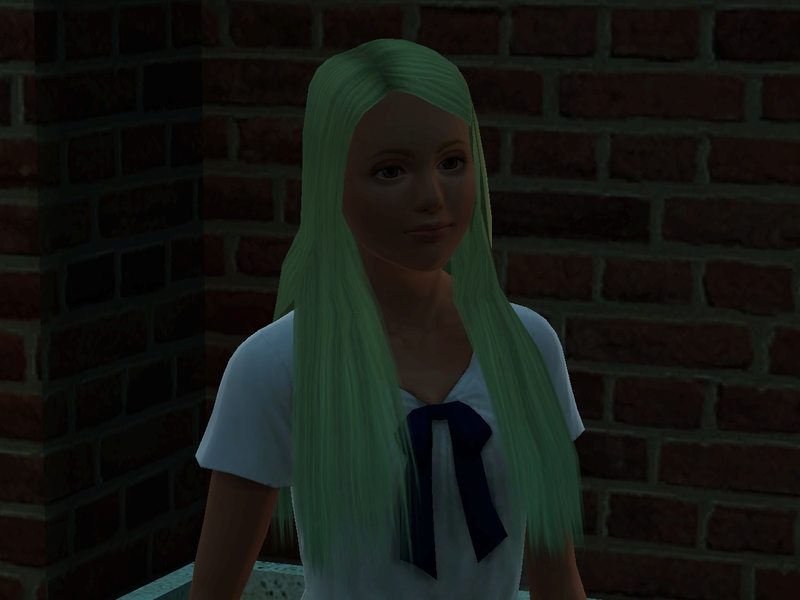 Lacey is pretty cute, especially for an EA sim of unknown origin. But it looks like she's going to be pretty hard for Branden to catch :). 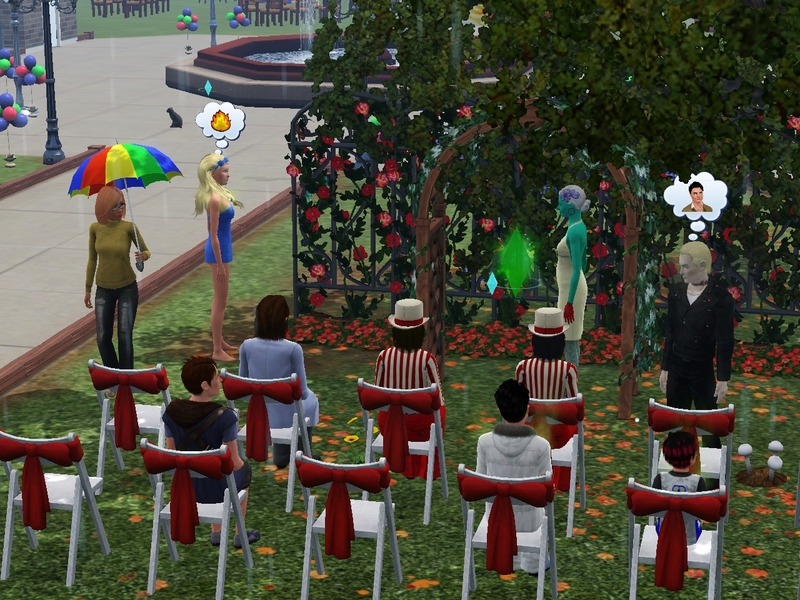 LMAO, wedding at the festival in the hail. Perfect for an idiot wedding! And Erin is absolutely perfect as the mix of her parents (and grandmother). 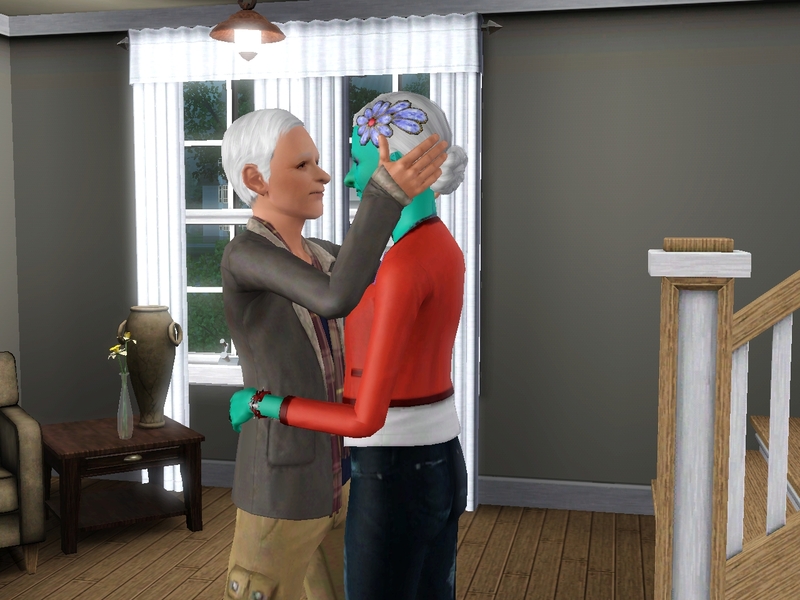 I’m glad that Jin and Chauncy got married! What a nice event! 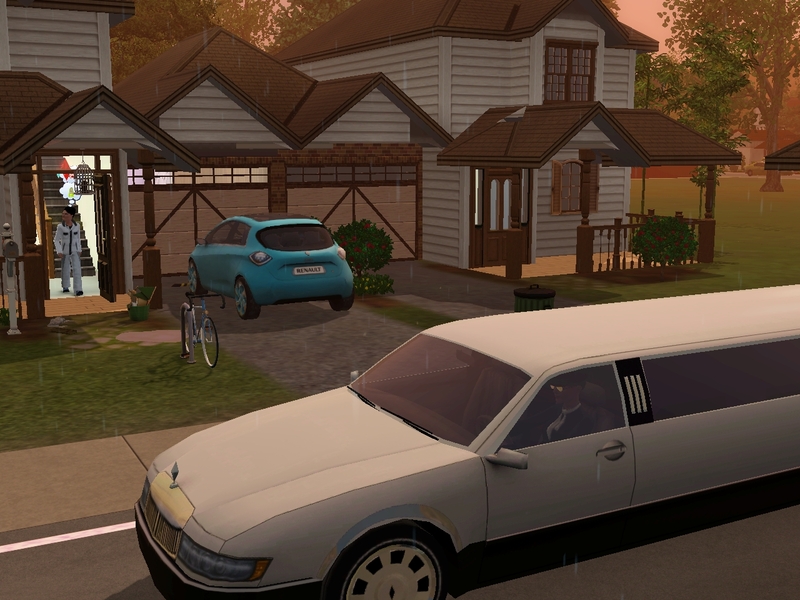 Leaving that poor baby in the hailstorm, LOL! But you’re right! Erin is adorable!